ATTENTION! MINIMUM PERIOD OF ROOM RESERVATION IS CARRIED OUT FROM 2 DAYS! 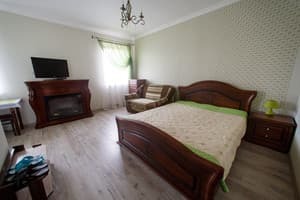 The guest house "U Ratusha" is located in the historical and picturesque center of Kamenets-Podilskyi, a 10-minute walk from the Old Fortress, the Dominican Monastery and St. Stephen's Cathedral. Peter and Paul. 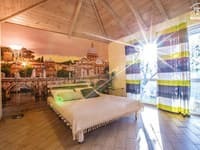 The brightly decorated rooms have a flat-screen TV, free WI-FI, satellite TV, a modern bathroom and a fully equipped kitchen. 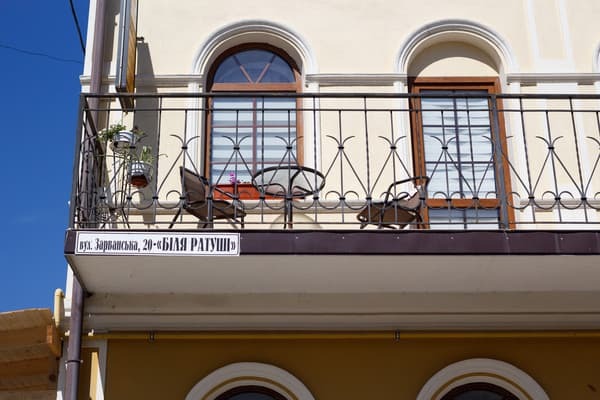 The guesthouse "U Ratusha" has a large terrace overlooking the city's sights. 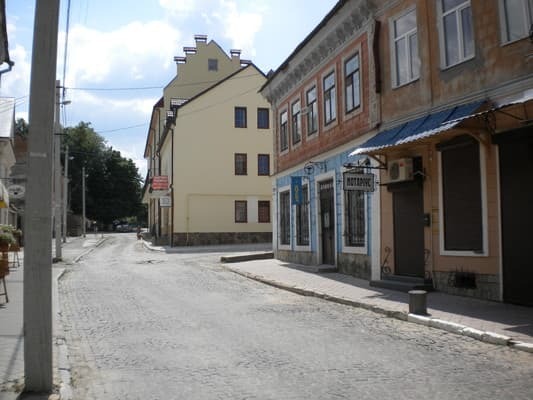 Описание номера: The apartment complex is located in the historical and architectural center of the city of Kamenetz-Podolsky. Standard apartments are made in light beige tones, equipped with a double bed and a sofa. The room has a refrigerator, microwave. The bathroom is equipped with a shower, a hairdryer and necessary toiletries. Satellite TV and free WI - FI are provided. The apartment overlooks the town hall. There is a separate living room. In walking distance, historical monuments, infrastructure facilities, free parking is located near the complex. We provide accounting documents. Описание номера: The apartments are made in light beige tones, equipped with a double bed. The apartment overlooks the town hall. To make an order, a prepayment is required. The size of the advance payment depends on the date of arrival and the period of stay. 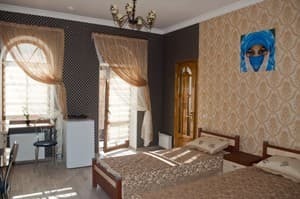 Описание номера: The apartments (blue-gold color) have a balcony terrace, are equipped with a double bed and a single bed. To make an order, a prepayment is required. The size of the advance payment depends on the date of arrival and the period of stay. 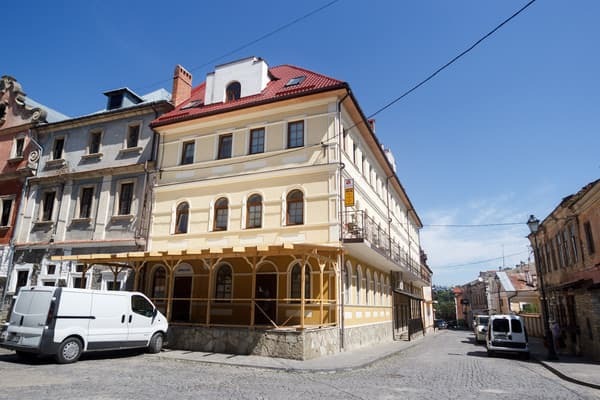 Описание номера: The apartment complex is located in the historical and architectural center of the city of Kamenetz-Podilsky. Studio apartments are made in light olive colors. The room has a double bed and a sofa, there is a refrigerator, microwave. 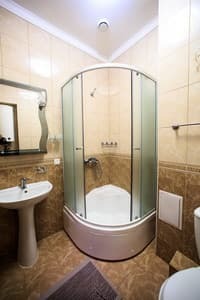 The bathroom is equipped with a shower, a hairdryer and necessary toiletries. Satellite TV and free WI-FI are provided. The apartment has a beautiful view of the city. There is a separate living room. In walking distance, historical monuments, infrastructure facilities, free parking is located near the complex. We provide accounting documents. The price is for 2 people, but it is possible to accommodate up to 3 4 people. The price is negotiated additionally. Описание номера: The walls of the apartments are light olive and have a balcony terrace with a breathtaking view of the city. The room has a double bed and a sofa. To make an order, a prepayment is required. The size of the advance payment depends on the date of arrival and the period of stay. Описание номера: The apartment complex is located in the historical and architectural center of the city of Kamenets-Podilsky. Apartment No. 6 is made in dark light beige shades. 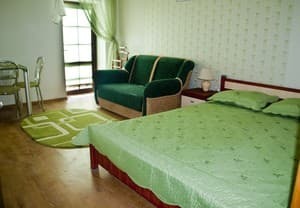 The room is equipped with a double and single bed, there is a necessary utensils, refrigerator, microwave, electric kettle. The bathroom is equipped with a shower, a hairdryer and necessary toiletries. Satellite TV and free WI - FI are provided. The apartment's windows face the street and the city. There is a separate living room. In walking distance, historical monuments, infrastructure facilities, free parking is located near the complex. We provide accounting documents. The price is for 2 people, but it is possible to accommodate up to 3 people. The price is negotiated additionally. 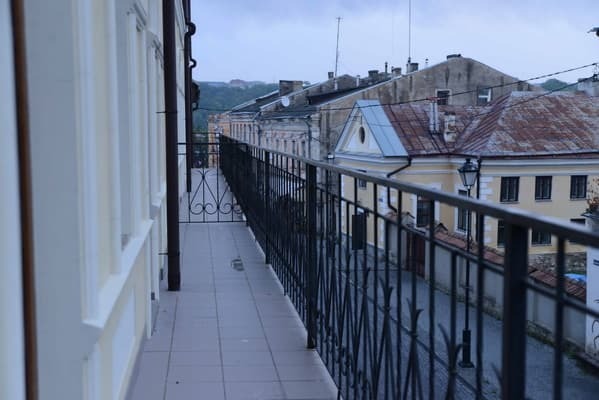 Описание номера: The apartments (red-golden shade) have a balcony terrace, with a beautiful view of the city. The room has a double bed and a sofa, a kitchen with the necessary equipment and a bar counter. To make an order, a prepayment is required. The size of the advance payment depends on the date of arrival and the period of stay. 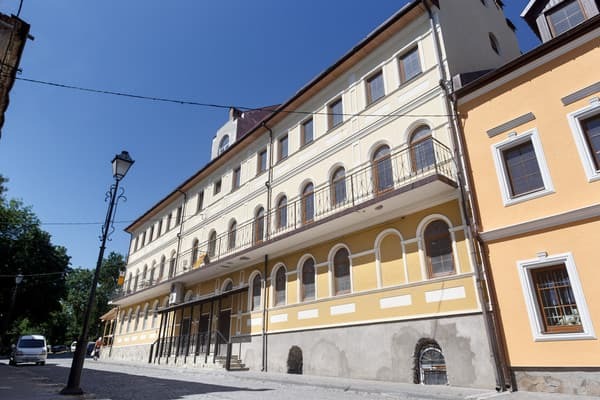 Описание номера: The apartment complex is located in the historical and architectural center of the city of Kamenets-Podilsky. Apartments No. 7 is the largest in terms of living area and is made in dark golden hues. The room has a double bed and two sofas, there is a closet, a refrigerator, microwave. The bathroom is equipped with a shower, a hairdryer and necessary toiletries. Satellite TV and free WI-FI are provided. The apartment has a beautiful view of the city. There is a separate living room. In walking distance, historical monuments, infrastructure facilities, free parking is located near the complex. We provide accounting documents. The price is for 2 people, but it is possible to accommodate up to 3 people. the price is negotiated additionally. 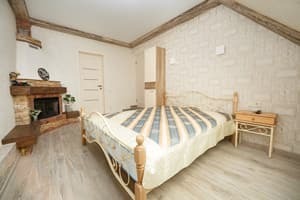 Description of the room: The apartment complex is located in the historical and architectural center of the city of Kamyanets-Podilsky Studio apartments are made in light golden tones. 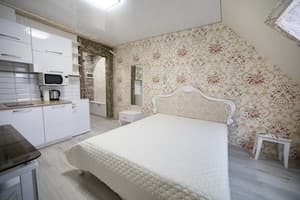 The room has a designer renovation, it has a double bed, its own mini kitchen (dining area) and all the necessary utensils for cooking, a refrigerator, a microwave. The bathroom has a shower, a hairdryer and the necessary toiletries. Satellite TV and free WI-FI. The apartments are textured and bright, pleasant for families. The complex has a separate household room. In walking distance of historical monuments, infrastructure, free parking is located near the complex. We provide reporting documents. The price is for 2 pax. 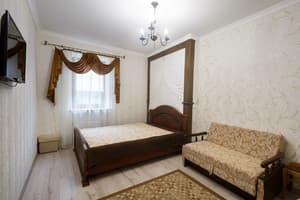 Description of the room: The apartment complex is located in the historical and architectural center of Kamyanets-Podilsky. Two-room apartments are made in the style of "Provence" with design decoration. Equipped with own kitchen. Each room has a double bed. The room has a fridge, microwave. The bathroom has a shower, a hairdryer and the necessary toiletries. Satellite TV and free Wi-Fi. Within walking distance - historical monuments, infrastructure facilities, free parking is located near the complex. We provide reporting documents. Check arrival: from 13:00 - 24:00 hours. Check leaving: to 11:00 - 11:00 hours. For the provision of additional revenge for an adult or child, a surcharge of 50 UAH. There is a restaurant on the territory of the complex. Apartments No. 1,2,3,4 have a fully equipped kitchen for self-cooking. 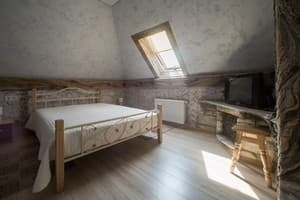 The Guesthouse "U Ratusha" is located in the historical and picturesque center of Kamenets-Podilskyi, a 10-minute walk from the Old Fortress, the Dominican Monastery and St. Peter and Paul's Cathedral. Kamenets-Podolsky bus station is 1.4 km away, and the railway station is 2.5 km away. From the railway station you can take a taxi № 7 (stop "Trinity Square").